In her latest film, The House With A Clock In Its Walls, Cate Blanchett steps back into the magical realm and, as is always the case when the two-time Oscar winner is on screen, she's magnificent. The Australian actress is undoubtedly one of the finest talents in Hollywood and while she might be better known for her more dramatic work in the likes of Elizabeth, Carol, and Veronica Guerin, she really cuts lose in Eli Roth's magical tale about a young orphan named Lewis who has to go and live with his uncle. Oh yes, that Eli Roth! The same man that directed Cabin Fever, Hostel and Green Inferno has now made a family adventure in the spirit of Gremlins, The Goonies and The Monster Squad. This is no ordinary house though, because Lewis' uncle Jonathan (Jack Black) is a warlock that needs his help to locate a clock with the power to bring about the end of the world. As the next door neighbour with a magical secret of her own, Blanchett's performance as Mrs Zimmerman is note perfect as she exchanges some great one-liners, insults and withering putdowns with aplomb. 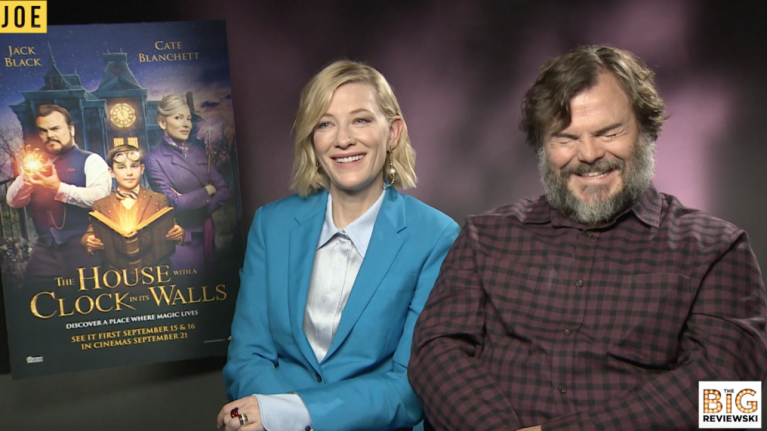 Of course, it takes two to tango and, as ever, Jack Black's mixture of manic energy and warmth is the perfect foil for Blanchett's wit, sardonic charm and empathy. Like a mix of Jumanji and the Harry Potter series, The House With A Clock In Its Walls has a real Saturday afternoon vibe to it, but if a lazy day at the cinema doesn't appeal to some people, there's always the pub and Blanchett has some experience with genuine magic there- she knows how to get a free pint in an Irish pub. Ever hear the one about the bar that gives their patrons free pints because they play an instrument? Well, there's always some chancer that will pass himself off as a musician just to get a free drink. This being said, we've never heard this trick before! Hell, if that doesn't trick work, then the two-time Oscar-winner can always join Tenacious D on stage and play the spoons. In fact, that might just happen. The House With A Clock In Its Walls is released in Irish cinemas on 21 September.